I was coming from the opposite direction of this horse and buggy and had to stop. Apparently this horse did not like crosssing over the open grid bridge. About 20 feet before the bridge the horse started to act up. 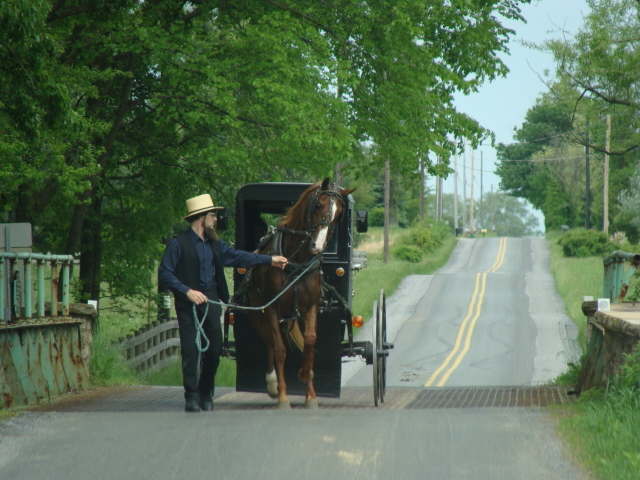 The Amishman got out and tried to lead him over and this horse tried to go every which way but straight across the bridge. Finally, he was able to coax him up to the bridge and over it. I couldn’t help but take this picture. I figured he was so busy with his horse he wouldn’t notice and therefore not mind that I took this photo. If they don’t notice does it count? I don’t think it does. They don’t like their picture taken as it is seen as a sign of vanity but if they don’t know then it can’t be about vanity. Can it? HOpe not!